The Cambridge 25" Wide Floor Lectern from Dalite has flush panels with wood-trimmed square-edged design for a deep, rich appearance. With a push of a button, electronically raise or lower the lectern's height within an 8" range. This lectern offers an over-size reading surface that holds a three-ring binder, and has heavy-duty industrial casters for easy mobility and a spacious storage shelf. This lectern from Dalite, a quality manufacturer - with more than 30 years of successful experience manufacturing audio-visual presentation equipment - is the answer to your presentation needs. 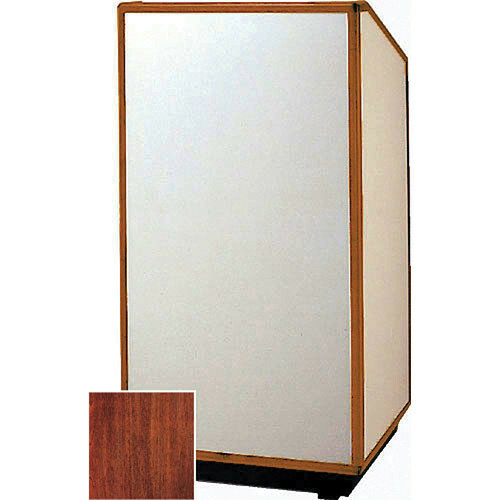 This unit contains an Anchor Sound System that delivers 60 watts of RMS power. RMS is the audio industry's de facto standard for rating power capability. The Sound System is used to enhance your presentation by assuring your audience hears you in the farthest reaches of the venue. The height adjustability assures that your presenter is comfortable and can be seen by your audience. It also helps prevent neck strain when reading from prepared material. Box Dimensions (LxWxH) 50.0 x 50.0 x 27.0"